It has been a while since we updated you all. We are bringing out new updates and working on things constantly so here is a summary of recent changes and additions to 7wizards. New Layout We have recently brought out a new layout for the main page, condensing the general look of the page to save space. 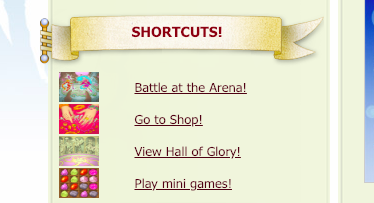 This layout contains a shortcut menu on the left side, where you will find direct links to the Arena, Shop, Hall of Glory and Mini Games. Meditation completion A few months ago, we brought out a feature that allows you to use your crystals to complete meditations. We are changing it around a bit! Now, you will have to pay gold rather than crystals to complete meditations. A new shop has been implemented with PayPal integration. To view the shop, go here or click the buy gold button in game. There is also a free trial of membership, gold and mana for a limited time. Get it before it leaves! That is all for now! We will continue to make updates & changes to the game in the future! okay, now this is epic!